What are the most important components in your home theater? Your room and your speakers. 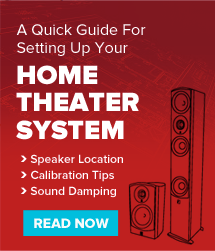 What this means is that how your speakers and your room partner up directly effects the quality of your home theater experience. Most rooms are fairly accommodating, but there are a few tips to be aware of. It’s best if your room is no smaller than 200 square feet. For smaller rooms place your viewing area (that’s where your TV goes) along a short wall. For larger rooms either a short or a long wall work equally well. Too many bare-naked surfaces in your room will reflect and distort the sound. Carpeting, drapery, upholstered furniture and that favorite lounge chair all work together to enhance acoustics. Oddly enough, a bookcase located behind the seating area works exceptionally well as a bass trap, to reduce room reflections and to help smooth out the high and mid range signals. A bass trap is something that reduces room resonances that can cause your bass to be too boomy. Now for the juicy stuff: speaker placement: Let’s start with your three front speakers. Your left, right, and center. How they’re positioned in relation to each other can dramatically affect sound. Center channel speakers work best if they are on top of the TV. If your center speaker is the common style that has two woofers on either side of a tweeter, it’s important to aim the speaker directly at the seating area.